As I’ve recently made the decision to cut down my skincare (as I was overloading my skin previously), having skincare favourites feels like more of a bit deal. There’s a few that have worked their way into my most used list in the past week or two and get my stamp of approval for making my skin feel wonderful. Starting with a remover, while the Benefit They’re Real! Push Up Eyeliner didn’t impress me fully (read my review here) their They’re Real Remover is one that gets my vote. As someone who wears eyeliner and mascara pretty much every day, using this step before my cleanser makes the job of removing makeup so much easier as it gets rid of any stubborn makeup. Recently, I think due to the change in weather, my skin has been a bit more congested so giving it an extra bit of exfoliation has been working wonders. 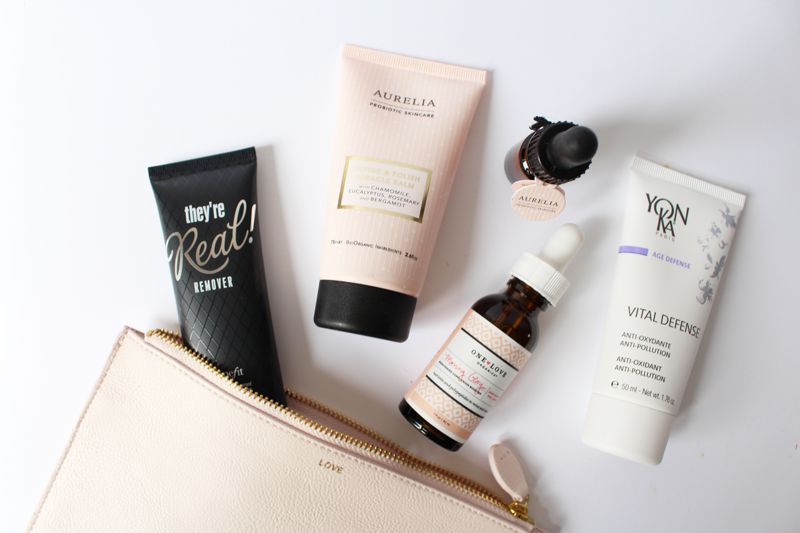 I’ve been using the Aurelia Refine and Polish Miracle Balm, which smells wonderful and really scrubs way any dull skin to reveal a brighter complexion. It’s definitely a product which will have permanent residence in my skincare routine as I really adore it. Another product from the same brand which I’ve used pretty much every day since I got it is the Aurelia Revitalise and Glow Serum. It, again, smells divine and has really brightened my skin over the time I’ve been using it. I don’t want my little vial of it to run out! You all know how much I love my facial oils (even though they class it as a serum) and a new one I’ve added to my collection is One Love Organics Morning Glory Brightening Complexion Booster. It glides over skin, offering hydration and a brightening boost (hence the name, I guess!) to my skin. It’s so lovely to use and I love mixing it into my moisturiser on a morning. Finally, I’m a bit fan of Yon-Ka as I think they make some amazing skincare products and the latest one in my collection is the Yon-Ka Vital Defense. It’s a day cream that’s aimed at purifying the skin and defending against environmental damage. It does help skin look more refined and adds a lovely glow too. It always leaves my feeling so hydrated too! What skincare products have you been loving this week? Oh and check out my blog sale too!